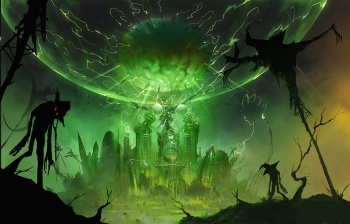 American McGee's twisted take on L. Frank Baum's Oz series needs a new name. Two weeks into his latest crowd-funding venture, American McGee is making some major changes to OZombie, starting with the title. "OZombie is causing too much confusion," the founder of the Spicy Horse development studio said in today's Kickstarter update. A new name for the game will be decided "shortly," with backers invited to leave their suggestions. McGee is also scrapping plans for a $1,050,000 stretch goal that would allow the company to acquire the rights to make an Alice: Otherlands film based on McGee's Alice property, as well as any related rewards. In a July 2 update, McGee stated that he added Alice: Otherlands to the OZombie campaign to "increase awareness about OZombie and put us in a position to secure and develop the Alice property as animated shorts and eventually feature film(s)." Sadly, McGee can't simply make a new Alice game; while talks to acquire the rights to do so have been "productive," an agreement between Spicy Horse and EA hasn't been reached yet. This doesn't necessarily mean the end of Alice: Otherlands; McGee stated that he will explore doing a separate Kickstarter or IndieGoGo campaign separately "if time allows." OZombie has currently received $134,227 of its $950,000 goal; there are 28 days left in the campaign.